One of the more famous book designs of the 1890s is undoubtedly John Gray's book of poems Silverpoints, published by John Lane, 'At the Sign of The Bodley Head in Vigo Street'. Its small and slim volume was regarded as innovative, especially in combination with the decoration of wavy lines and willow leaves stamped in gold on the green cloth covers and the page design with its vast areas of blank paper underneath a small block of text printed in italics. Charles Ricketts's design was copied 'in various media'. 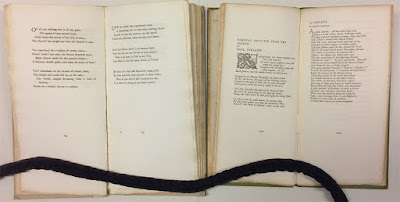 The binding design was 'stolen' by other publishers such as Thomas Bird Mosher (see blogs nos 146 and 148), and shameless imitations popped up in many prize competitions. London publisher Grant Richards also liked the format of Silverpoints. In 1917 he used a similar format for Thomas Burke's London Lamps. Its binding was of plain orange cloth. 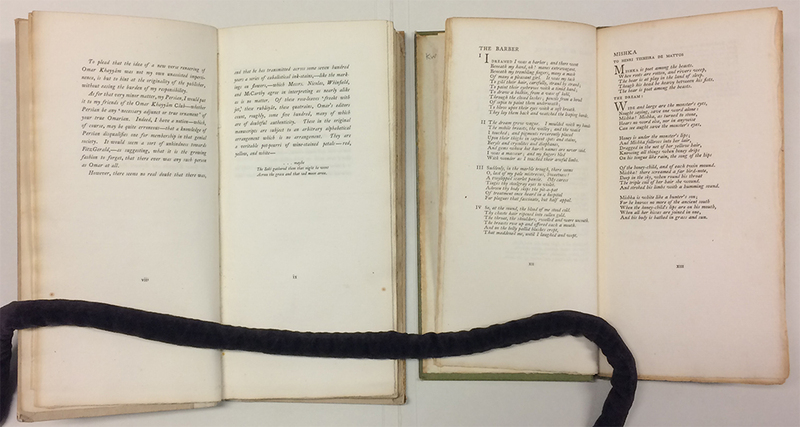 Earlier he adopted the format for a new translation of Rubáiyát of Omar Khayyám, or rather a 'paraphrase from several literal translations' as the subtitle duly noted, by Richard Le Gallienne. The book is only slightly larger. 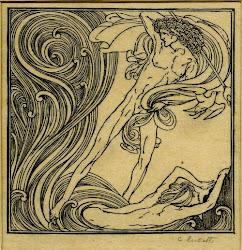 Rubáiyát measures 23,0 x 11,5 cm; Silverpoints is 21,5 x 11 cm. The proportions are quite similar. The Omar Khayyám paraphrases only just occupy the upper half of the pages (as can be seen in the introduction); the page is 23,5 cm high, the texts don't go below the 9,5 cm line from the top, the page number can be found at two-thirds of the page in a sea of white. The poems all start with a small and plain initial. There is no comparison between the subtle lay-out of Ricketts's Silverpoints and the design for Le Gallienne's version of Omar Khayyám. Ricketts decided to print all lines of verse in italic, adding large initials in roman. 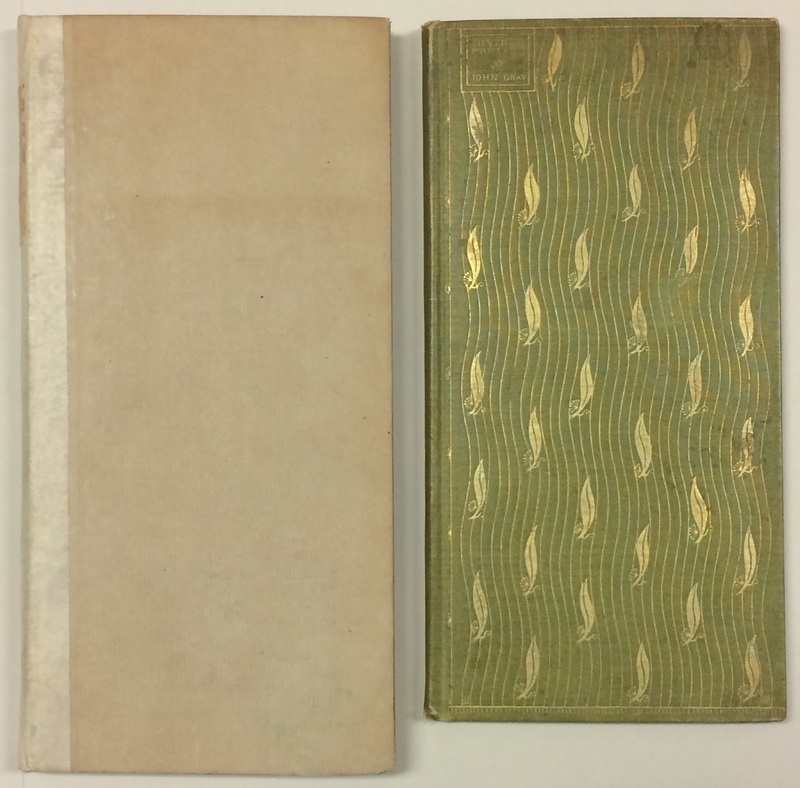 The Grant Richards publication followed the trend of luxurious books, printing the Omar Khayyám book on Unbleached Arnold handmade paper. There was also a small number of copies on so-called Japanese vellum. The lay-out also followed a trend of large margins, and an elegant though affected placement of text at the top of the page.